The story of both projects begins in 2008, when the Abu Dhabi United Group took over at Manchester City and decided to make it one of the world’s best clubs. Though some might argue, it’s already in that place, but the ambitions are much higher. The Eastlands stadium expansion had been rumoured about since the club was taken over by new owners in 2008, but wasn’t confirmed until spring 2013. In May the club released the very first rendering of what is to be a new third tier over two existing at the south end. Capacity increase is thought to be 6,250 with some seats being among most affordable at top Premier League clubs. Identical operation would later be done to the northern side of Etihad Stadium, allowing it to become English football’s second biggest club stadium. The planning application was filed in December 2013 as planned, first piling works started already in February 2014. First full season with the expanded south end would be the 2015/16 tournament. Also, in May 2014 the club announced it will add 3 rows throughout the stadium, just behind the pitch. While this will bring some spectators closer to the action, it will also mean the stadium will have 5 rows (!) sunken under field level. The stadium is part of City Football Academy, a sports excellence project by Manchester City. It will not only be one of 16 full-dimension pitches, but also place of all important youth matches with its 7,000 covered seats. Under the east stand new Manchester City headquarters are to be created with many offices, some of which are to overlook the pitch. There’s also room for a restaurant/lobby and an impressive media theatre for press conferences. On the opposite side of the pitch facilities for players are to be created along with significant amount of commercial space. Construction of the stadium began in June 2013, while the entire complex was on track since mid-2011. It will cover 32 hectares left after the famous Aniline dyestuffs factory, demolished in 2007. 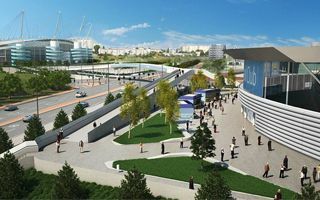 The main stadium will be located in Academy’s north-western corner, having a pedestrian bridge connection with Etihad Stadium across the road. The stadium will be ready for launch in the 2014/15 season of Premier League.